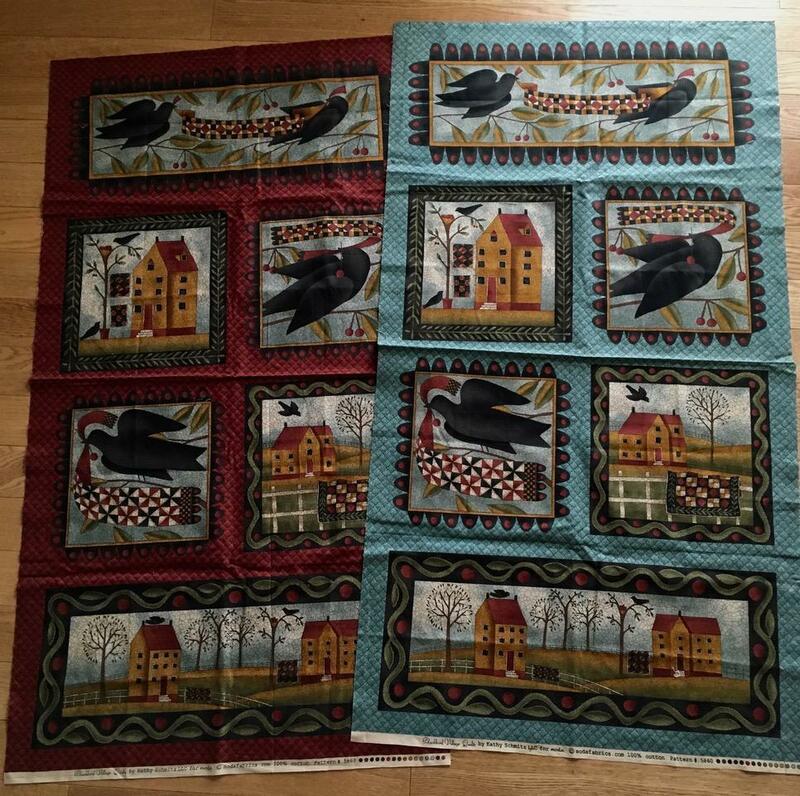 These two panels with coordinating fabrics were purchased at a quilt show in Lander, WY about three/four years ago. 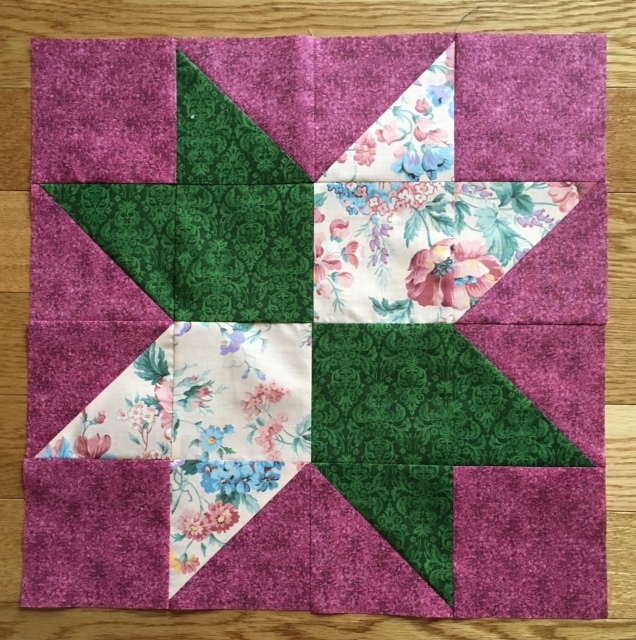 I placed this project on my UFO Challenge list, and April was the assigned month for working on this project. 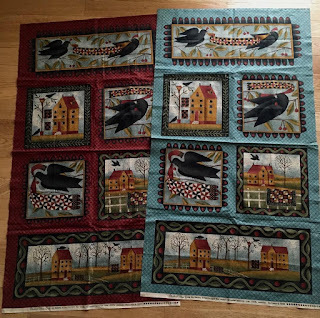 I initially thought the birds were crows, but they are blackbirds, and the Moda fabric line is called Blackbird Village. My thought was originally to cut the panel blocks apart, and after doing a lot of searching for ideas, I decided to come up with my own plan. The panel blocks would be framed to finish at 12 inches, so I searched for some fun 12 inch block patterns to sew from the coordinating fabrics. Little by little the 12 inch blocks were made and placed on the design wall around the blocks trimmed from the panel. 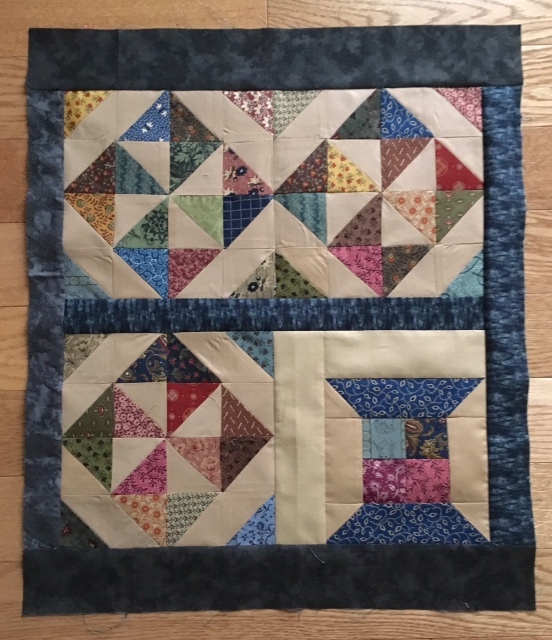 I didn't frame the panel blocks until all of the accompanying blocks were finished. 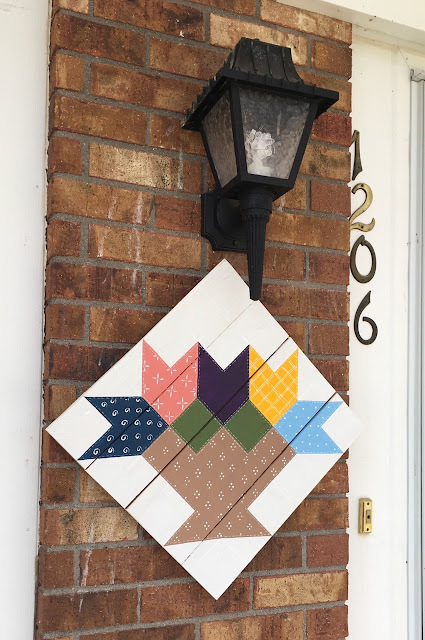 Once all the accompanying blocks were made, I framed the panel blocks with 1.5 inch black strips and squared the blocks to 12.5 inches - the same size as the accompanying blocks. All the blocks were sewn together to create the center of the quilt. I added a 2 inch black frame around the assembled rows. I didn't have any fabric for the outer border, so I ordered 2 yards. 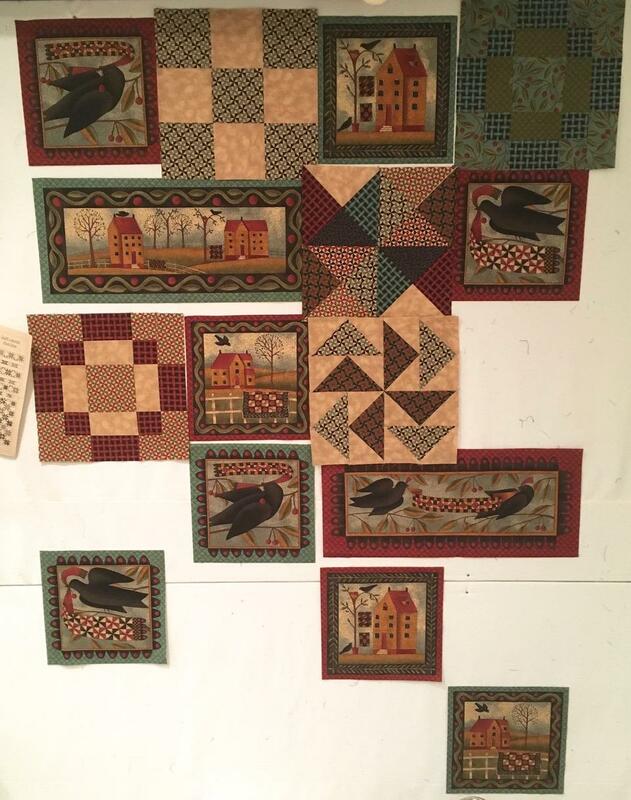 Blackbird Village may not be completed in April, but it will not take long to add the outer border when the fabric arrives. It appears that Spring has finally arrived in the Rocky Mountains. Snow is still possible in the forecast, but the temperatures are nearing the 70s and new growth is appearing. It seems appropriate that pair #5 for the 2018 Box of Socks knit with Cherry Tree Hill - Spring Thaw is off the needles just as spring arrives. My parents purchased a farm in the Pavillion area in the late 1930s. They developed the farm, and all of the buildings were constructed by my Dad. 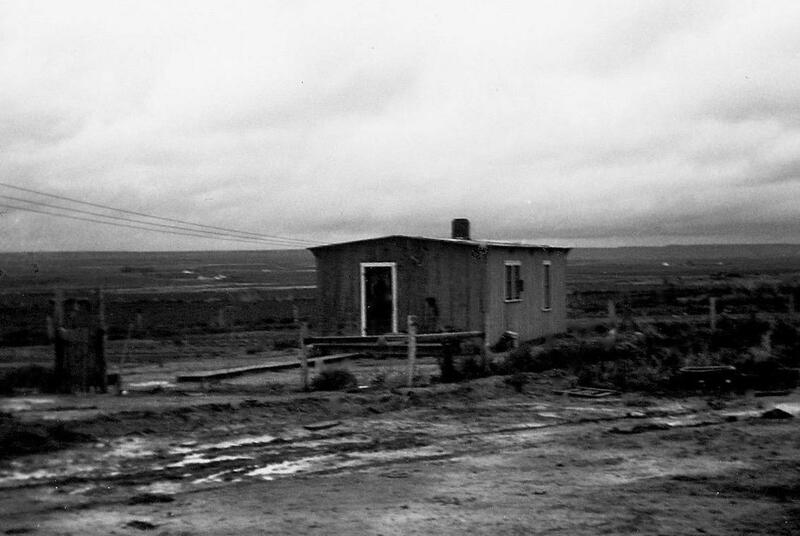 The house started as a simple shack and additions were added as needed. The exterior of the house was tar paper until the mid-1960s when pink aluminum siding was installed (see post below). 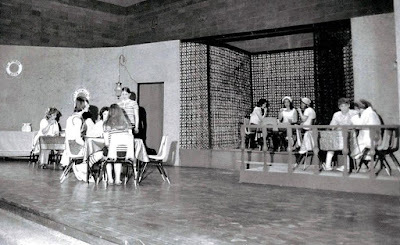 A cement walk and patio was added in the early 1960s. 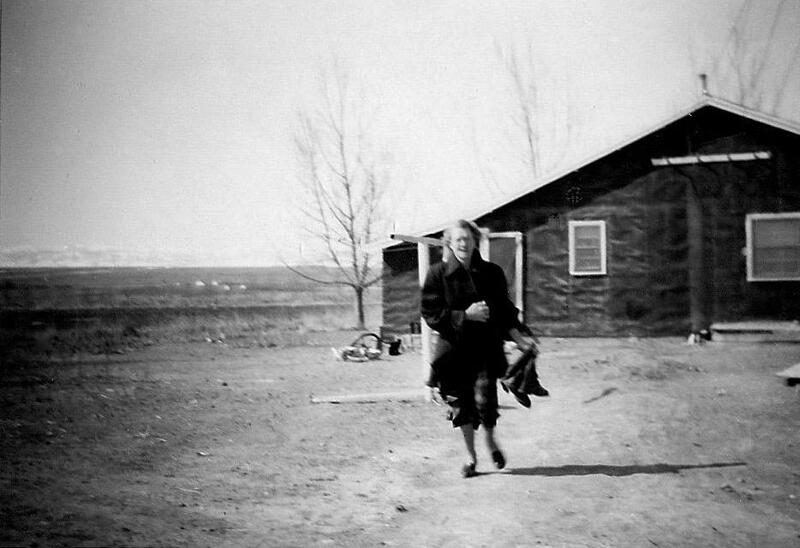 A white pipe clothesline pole is just visible over Mom's right shoulder, and two more poles were further to the right. The clothesline was large enough to hang all the family laundry. 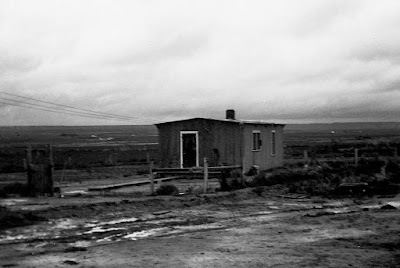 In the late 1960s a garage was built to the right of where Mom is located in this photo. Note the Wind River mountains can barely be seen on the horizon. The trees in back of the house grew considerably over the years and blocked some of the view. Behind the row of trees was an orchard, and two more rows of trees for a nice windbreak. When the trees were full grown, it was possible to stand in front of the house on a windy day and barely feel the wind. I usually make a sample quilt block before starting a project, so before cutting fabric for the Star Gazer QOV, I worked with some scraps to purposely create an "orphan block" with another project in mind. 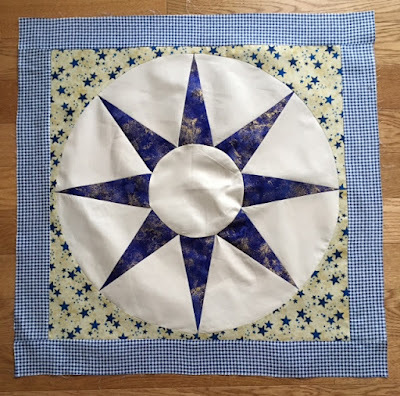 The blocks for Star Gazer were large (16" finished) and by adding a border, I'd have a quick doll quilt for the A Doll Like Me project. One of the UFO goals for the April UFO Challenge was to use the orphan blocks that have been marinating since 2010. They were transferred into a doll quilt, too. 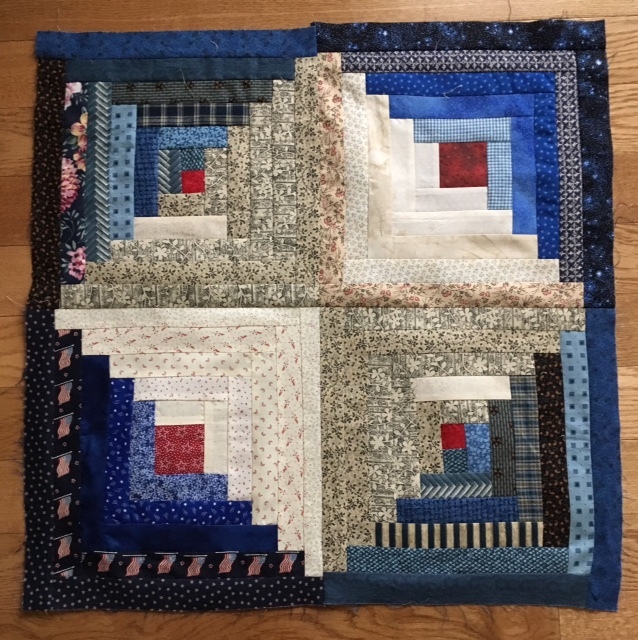 Sand Boxes (2010) was the first Quilt of Valor that I made, and these four orphan blocks have been shuffled from pile to pile and box to box for over eight years. I'm glad they have found a purpose. Some orphan blocks that Teresa C. sent in November wouldn't quite work for Quilts of Valor, so I turned them into doll quilts for the Doll Like Me project, too. I hope Teresa doesn't mind that these blocks were used for the A Doll Like Me project. These doll quilt tops still to be quilted, but now that the orphans are at this stage that should happen before the end of the month. I couldn't help but smile at this photo I took of a painting on display in the National Wildlife Art Museum near Jackson, WY in 2012. This time of year as the tender shoots of new growth appear along the river banks, it's possible to see various wildlife grazing. The placard by the painting stated, "The title of this piece encourages an anthropomorphic reading, a group of ladies having lunch, but the picture itself resembles a natural scene, a group of cow moose chomping Alaskan vegetation, separated from the males. 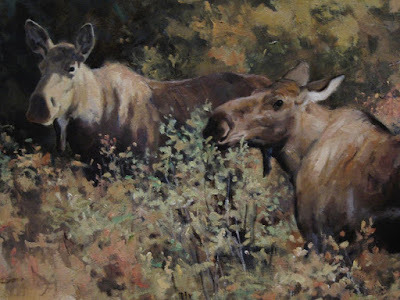 Though paintings of male animals vastly outnumber paintings of females, contemporary wildlife artists have begun to close the gap by depicting scenes like this." The photo was taken when I joined Nancy, Trish, and Jane in 2012 on a road trip to Jackson. Older posts of that trip can be seen here, here, and here. Many people say, "Let's meet for lunch," but they often do not intend to follow through. I have lunch with friends frequently. Sue, Bert and I schedule a lunch at least once an month. 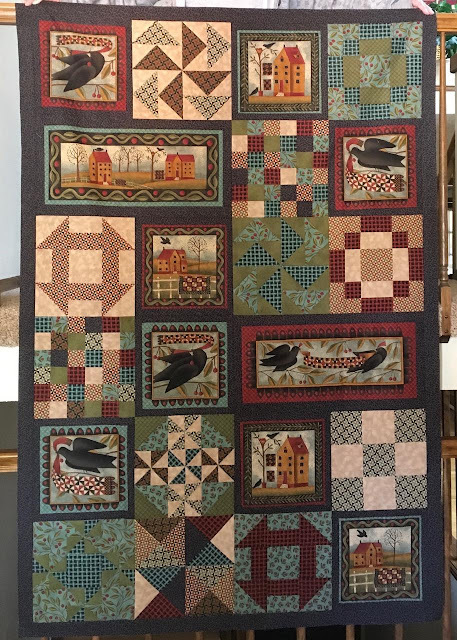 Cheryl and I often meet for a meal and a trip to the casino, and Sheri and I will have lunch and discuss quilting and sewing projects. Sometimes, Katheryn and I chat over a cup of tea. Do you regularly enjoy lunch with friends? 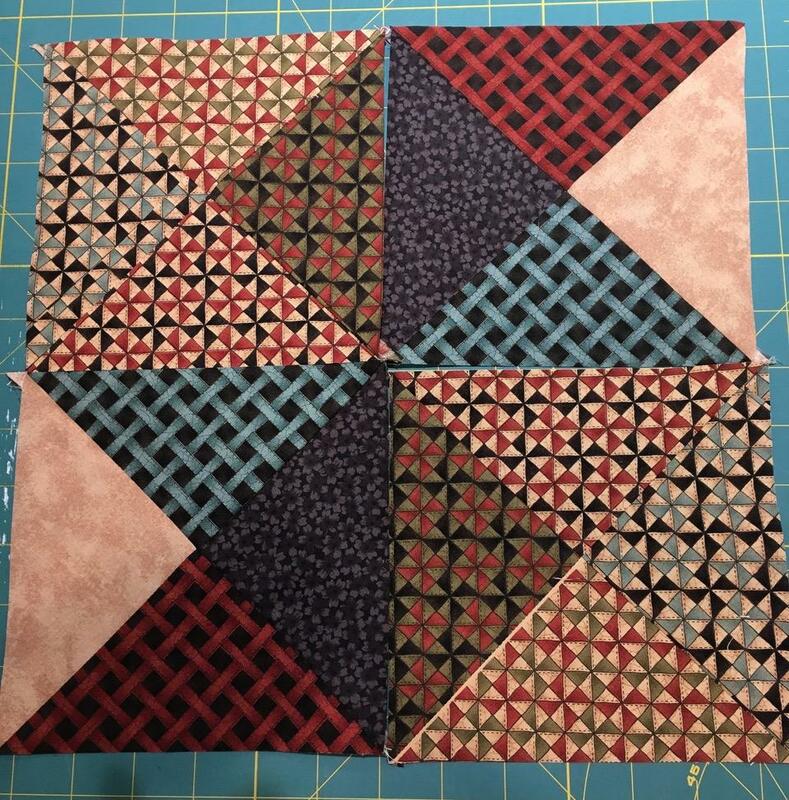 Clue #3 for the Square Dance QAL didn't involve any sewing, as half of the units from clue #2 were subcut using a marked template. 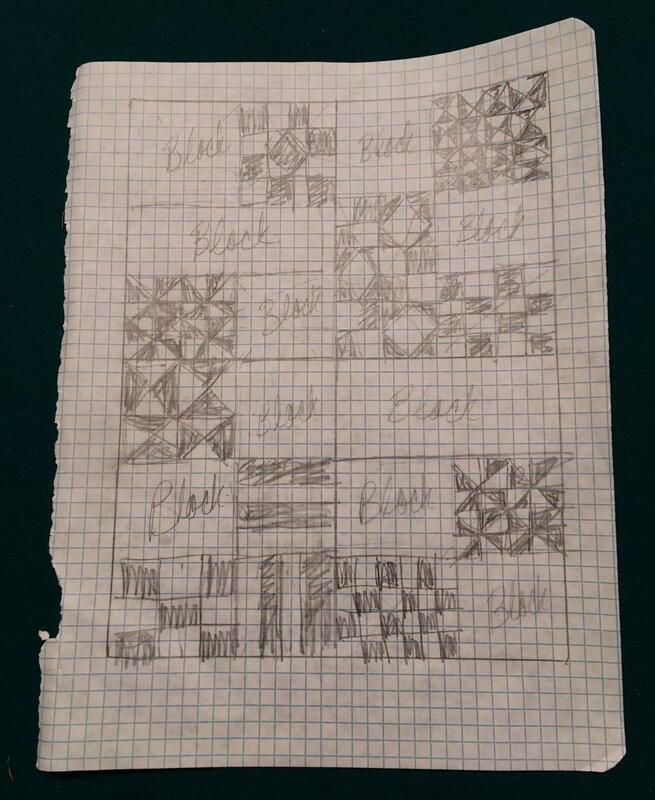 I can only guess how this set of pieces and the remaining units from clues 2 and 1 will come together to form blocks. 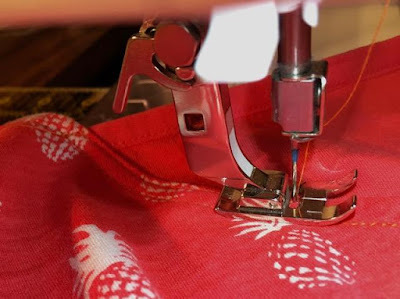 Did you know that tomorrow is Local Yarn Shop (LYS) day? 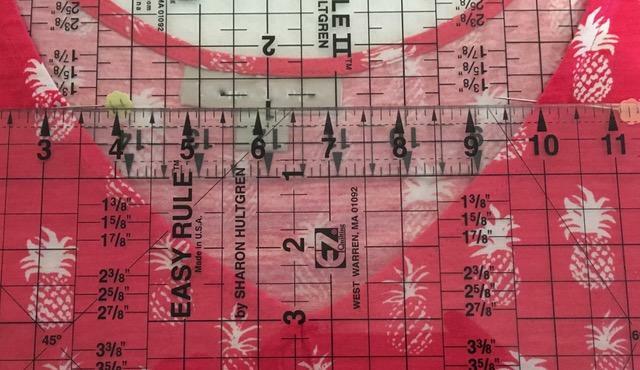 Several brick and mortar yarn shops will be celebrating with classes, demonstrations, special sales, and door prizes. What do you like about your local yarn shop? 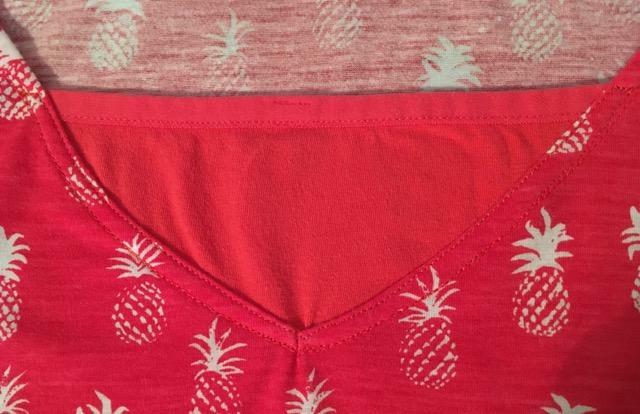 I recently purchased a couple of simple sundresses for summer. 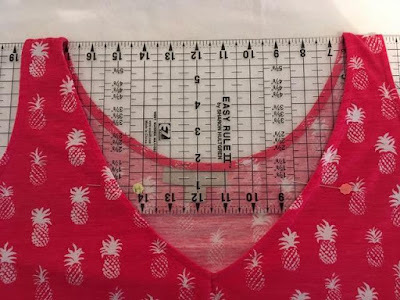 I love the dresses, but I did not like the depth of the neckline opening and decided to add a "modesty panel." 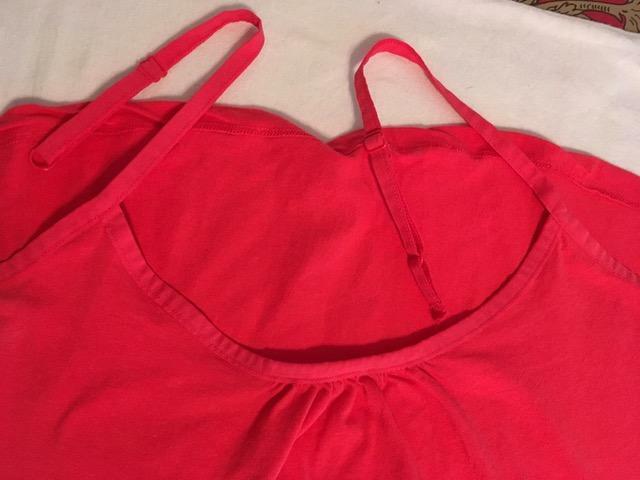 I went to the local thrift shop on Thursday and found a camisole that was close to the color that I needed for two dresses and at $1 it was the right price. 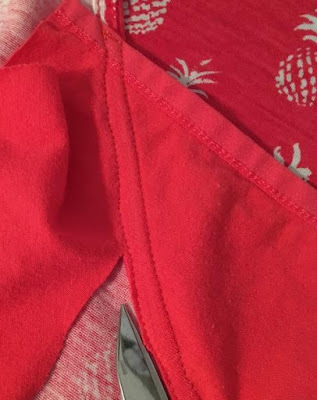 I carefully removed the straps by removing the stitches securing them to the back edge. 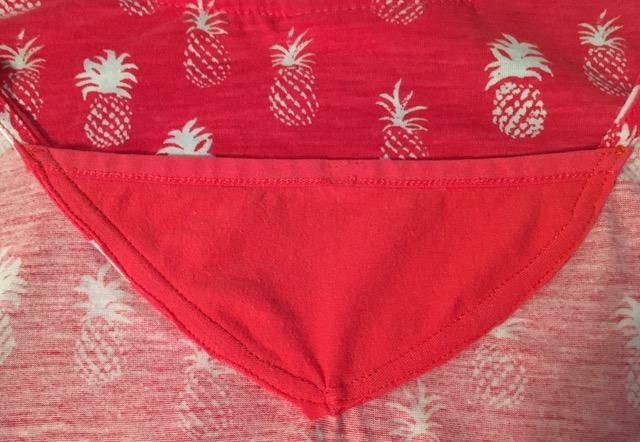 I didn't want to use the gathered front edge of the camisole, so I used the back instead. 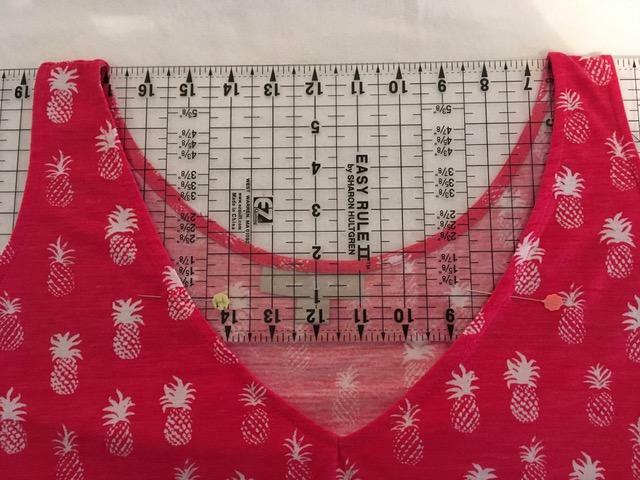 The back was in better condition than the front, and it was a straight edge. I could also use the entire back, creating panels for both of my dresses. The dresses are different fabrics, but they share similar color schemes. 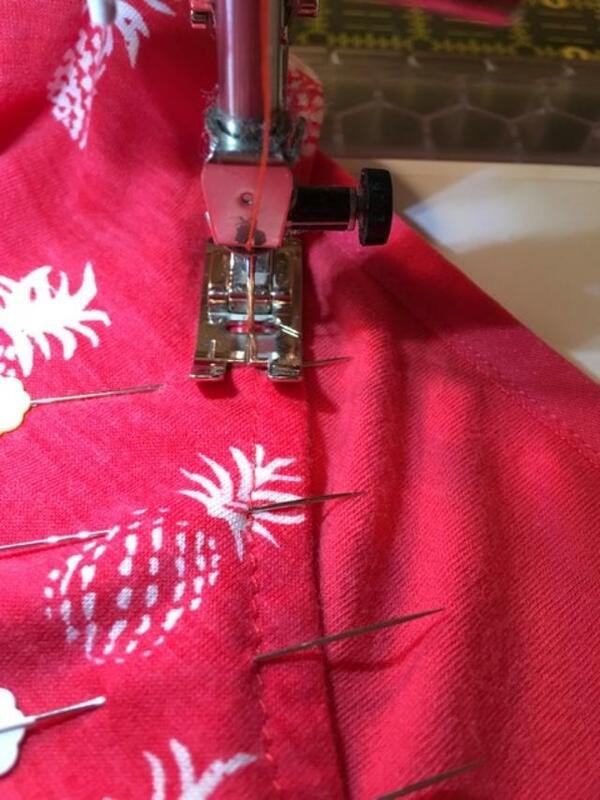 From the measurements, I determined the panel needed to be 3 inches deep, and I marked the edge with pins. Next, I cut the panel and made sure it was the correct size. After I had pinned the fabric panel in place, I tried on the dress to make sure the panel was where I wanted it to be. I found some thread that almost matched and began stitching along the existing neckline stitches, removing the pins as I stitched. 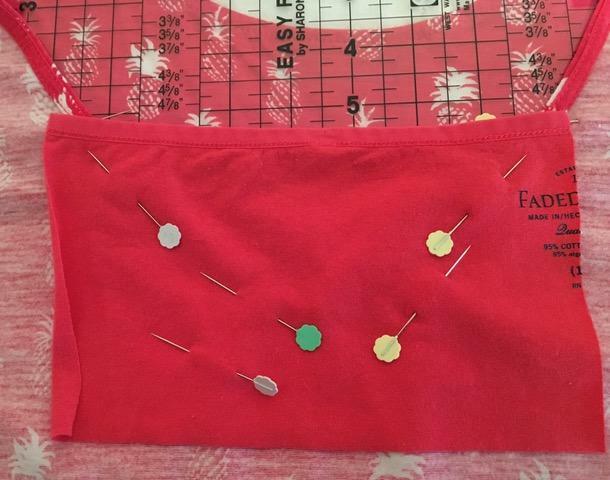 I top-stitched close to the neckline edge to add a finishing touch to the panel. 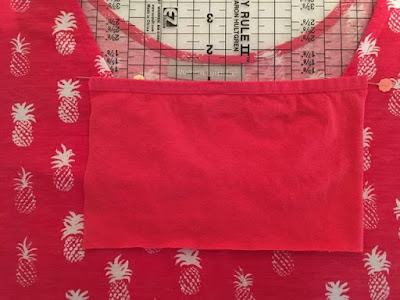 The dress was turned inside out, and I trimmed the excess fabric close to the stitch line. 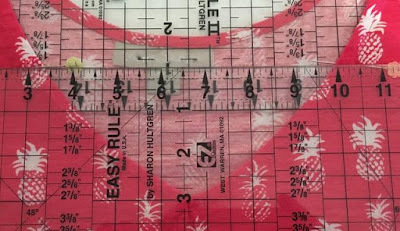 The trimmed edge should not roll or fray. The back edge of the camisole provided fabric for modesty panels for two sundresses, and I'm thrilled that I can wear the dresses comfortably and that the fix was quick and easy to do. Judy's Gift was made the layer cake squares remaining from the stack I received from Judy M. in February. 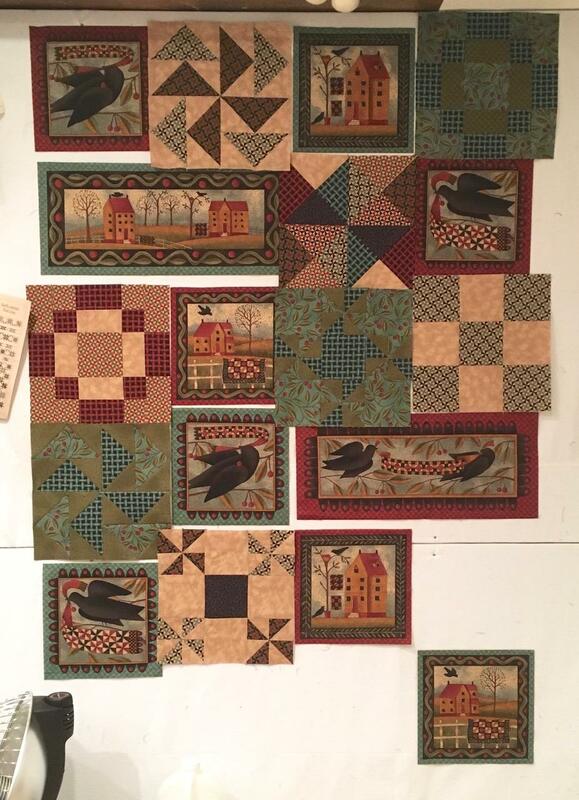 To make the quilt large enough, I supplemented some 10 inch squares from my Quilt of Valor scraps. 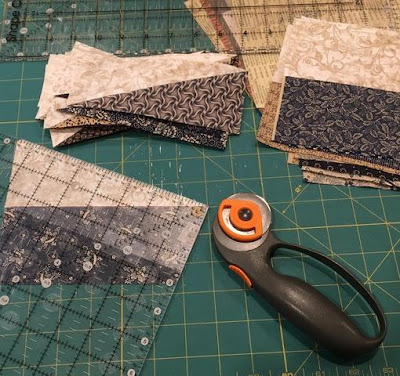 The border fabric was part of Judy's generous fabric donation. 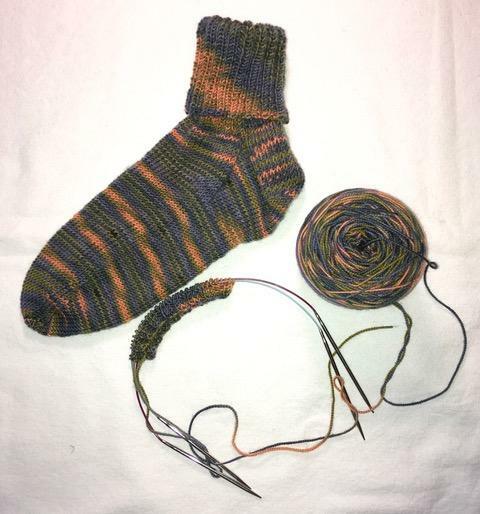 I've finished two socks so far this month, but they are not even close to being a pair. 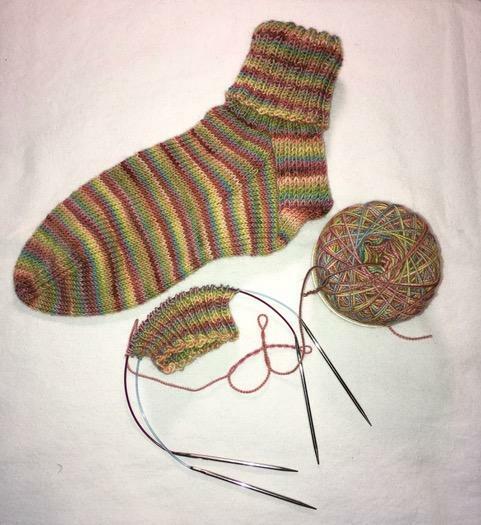 The first sock of the "non-pair" is being knit with Cherry Tree Hill self-striping yarn, called Sweet Summer. I didn't notice until I cast on the second sock that the striping changed on the first sock - the sequence is backwards near the toe. As I knit, I felt the join but didn't pay attention to the sequence. 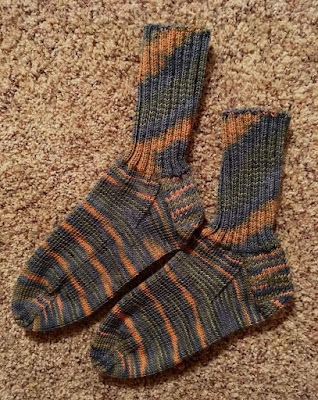 Even though the socks won't match, I rewound the yarn for the second stock to make sure the striping sequence is the same. The second sock is also being knit with a Cherry Tree Hill yarn. This color way is Spring Thaw and has a mix of orange, green, gray, and a tiny bit of black. Both of these skeins do not contain any nylon, so they probably will not wear/wash as well as the other socks I've knit this year. I'm ahead of my goal for knitting a pair of socks a month. 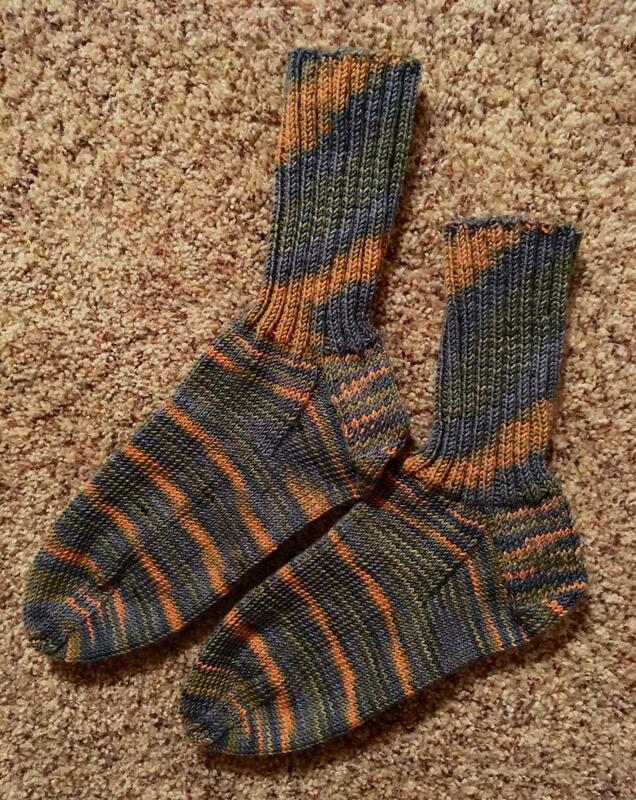 When finished, the Sweet Summer and Spring Thaw socks will become pairs #5 and #6 for 2018. 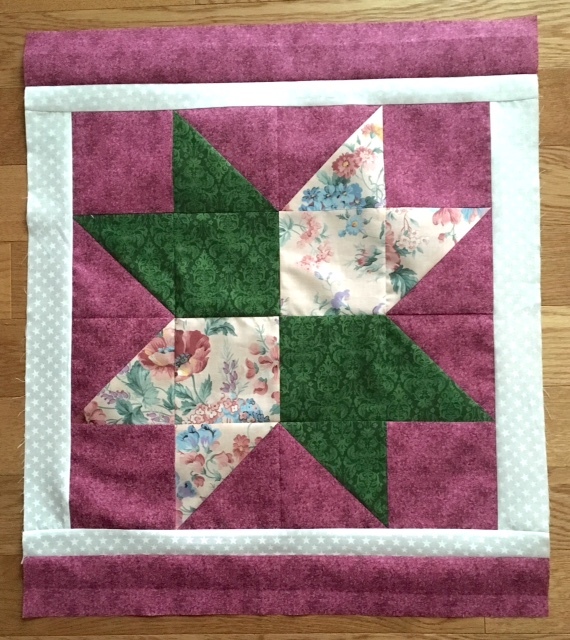 Star Gazer was made entirely from the fabric that was donated by Judy M. (Lynchburg, VA) in February. 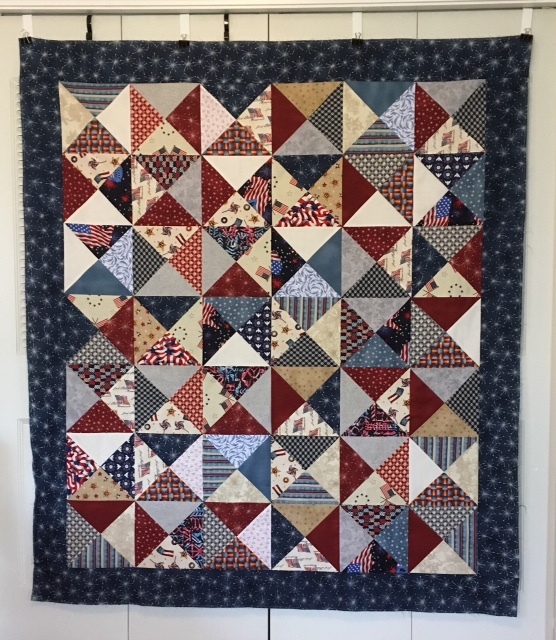 Judy, thank you for making this Quilt of Valor possible. This was the first play I directed in the new theatre, and I remember selecting this script because it could be staged without a proscenium curtain, which wouldn't be installed for several months. The lacy screen in the set is actually the plastic rings that holds a six-pack of soda together. 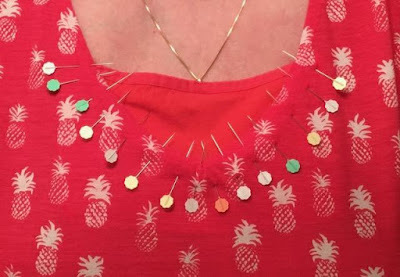 The rings were stapled together and spray-painted black. 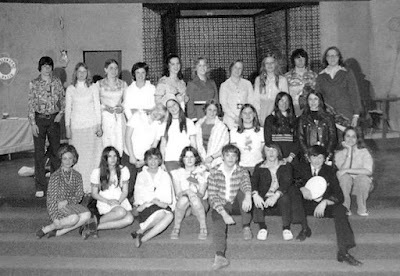 Looking at this cast photo, I can remember many of the students' names and wonder where their lives have taken them and if they remember performing on the Wheatland High School stage. Even though it feels like Spring is taking its sweet time arriving, it's pretty typical for it to arrive in late April or early May in this area. The only new growth appearing in my yard are tulips breaking the ground and slowly growing. It will be a few weeks before they bloom. The trees are starting to show buds and the grass in somewhat green under its brown winter layer. 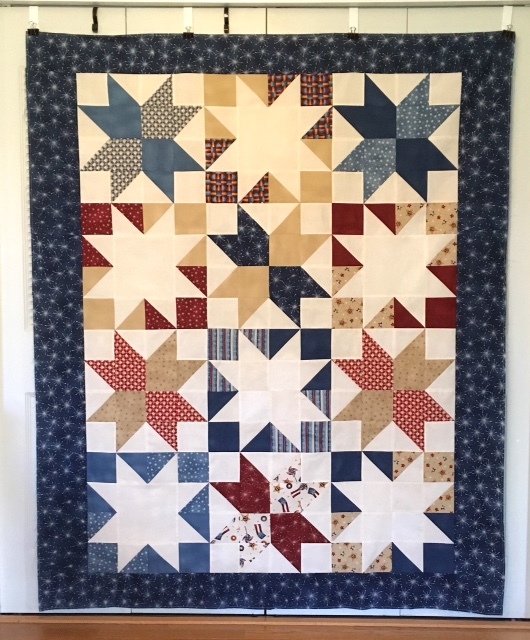 In the spirit of the season, I hung the "Spring" house/barn quilt that Brenda helped me painted last summer. I love these signs and the bit of color they add to the entry. Thanks, Brenda! 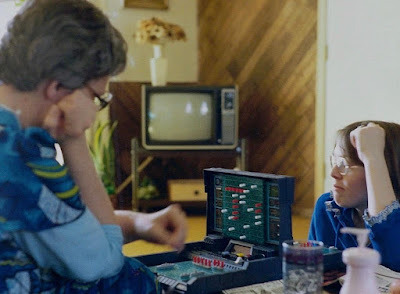 Judy (Stitch Along with Me) posted a photo last week of her grandchildren playing Battleship, and the photo triggered some good memories of playing the same game with my niece and nephew over 40 years ago. I found a photo in my computer files - Brenda and me playing Battleship. From the photo you can see that Brenda was a worthy opponent, as it appears she had found two of my ships and I'd found two/three of hers. Based on Judy's photo, it looks like technology has changed the game a bit, but the concept is still the same.